STEP 1- Meet your account manager! STEP 2 - Build your product! STEP 3 - Submit your order for production! STEP 4 - Design your label! STEP 5 - Your product is ready! STEP 6 - Get ready to start your business! Apple Cider Vinegar has often been used to treat various conditions. It has been promoted to aid weight loss, but swallowing the liquid can be very difficult. 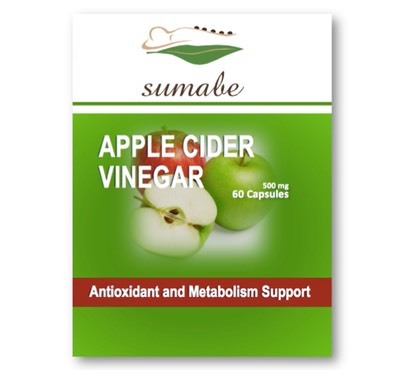 Sumabe® Apple Cider Vinegar offers all the health ben- efits of Apple Cider Vinegar in an easy to take capsule. Combining Sumabe® Apple Cider Vinegar with exercise and a reduced-calorie diet may give you the additional “push” your body needs in order to reach your weight-loss goals. Apple Cider Vinegar minimizes hunger, boosts energy and increases the metabolism. Adults, take 2 capsules daily, with meals, or as directed by your healthcare professional.